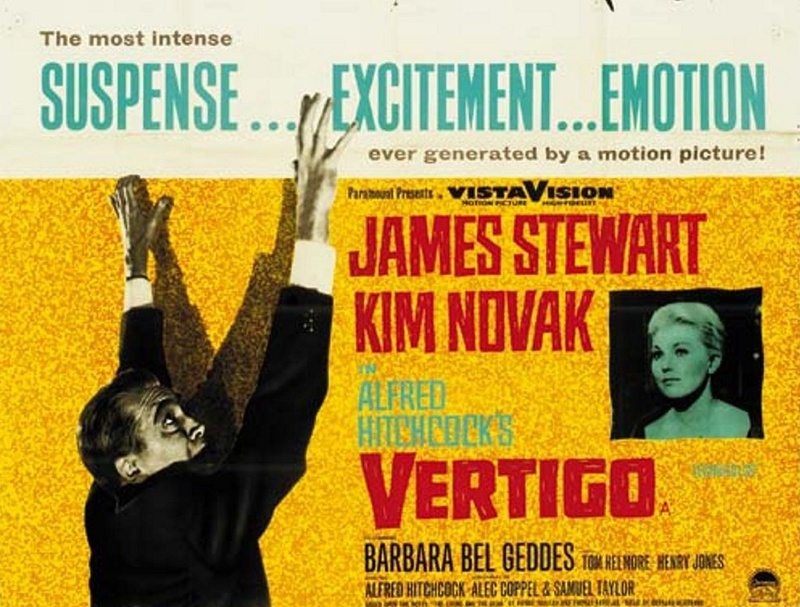 Most audiences were puzzled and disappointed by Vertigo when it first appeared in 1958. Ticketbuyers of the time likely wanted a rollercoaster ride much like other Alfred Hitchcock classics of the 1950s (North By Northwest, To Catch a Thief, The Man Who Knew Too Much). What they got instead was something much darker and more complex, even though the movie’s plot seemed – in synopsis, at least -- the perfect blueprint for a straight-ahead, standard-issue popcorn flick. Ex-cop John “Scottie” Ferguson (James Stewart) is asked by an old friend to watch over the friend’s wife, Madeleine (Kim Novak), a beautiful but troubled woman who fears she is possessed by the spirit of a mad ancestor. Ferguson is fascinated by Madeleine, and can’t help falling in love with her. But he’s unable to stop her suicide because of his own weakness: His fear of heights, the “vertigo” of the title, prevents him from reaching her before she throws herself from a church tower. Guilt-ridden and devastated, Ferguson suffers a nervous breakdown. While recovering, he meets a woman who is (pardon the expression) a dead ringer for his late beloved. Judy (Kim Novak again), a department store clerk, is wary of Ferguson’s attentions, but agrees to date him – and, eventually, to be supported by him. She objects, though not very strenuously, when he tries to remake her in Madeleine’s image, changing her clothes, her shoes, even the color of her hair. Don’t worry: No spoilers here, even though Hitchcock himself spills the beans well before the final scene. For those who prefer to enjoy Vertigo merely as a clever melodrama, and who haven’t seen any of its innumerable imitations, the surprise may come as a modestly satisfying jolt. But there’s much more to this must-see movie than an ingenious plot twist. 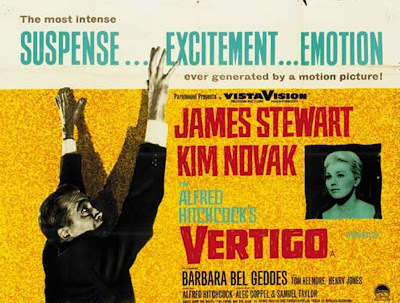 But Vertigo also can be viewed as a study of sadomasochistic symbiosis, with Ferguson single-mindedly struggling to re-create a “perfect” relationship, and Judy reluctantly agreeing to be stripped of all identity to please the man she loves. You could argue that Judy is the more deranged of the pair, in that every action she takes hints at a bottomless self-loathing. You could also argue, however, that Judy gradually emerges in the movie’s final reel as the more sympathetic character. James Stewart is at the top of his form here, brilliantly playing Ferguson as a discontent, resolutely practical man who’s swept away by grand passions that are not unlike madness. (There’s a bitter irony at work: Ferguson, the man who’s afraid of falling, allows himself to be drawn into a different but equally dangerous vortex.) Stewart’s subtly nuanced and profoundly affecting performance provides the perfect counterpoint for Kim Novak’s fatalistic intensity as Madeleine and her skittish, anxious submissiveness as Judy. Vertigo is a fever dream of a romantic tragedy, with elegantly graceful passages – particularly the long, silent sequence that shows Ferguson following, and falling for, Madeleine – and foreboding undercurrents. Bernard Herrmann’s score is at once lush and ominous, the perfect balance of musical moods. And cinematographer Robert Burks bathes San Francisco in an eerie glow that intensifies the lyrical beauty of key images, but also hints at hidden deceptions. After multiple viewings of Vertigo over the years, I have come to wonder: What would the reaction have been back in 1958 – indeed, how would critics, academics and movie buffs view it today – if Hitchcock had opted to end this masterwork about ten or 15 minutes before he does? (Assuming that the Production Code would have allowed him to do so.) That is: What if The Master of Suspense had announced “The End” immediately after Ferguson and Madeleine share their fevered embrace in her hotel room, bathed in a greenish light that seems to signal a shared madness, as she finally abandons all trace of her true self and he passionately grasps his last hope for a second chance? And what if the audience were left to consider that the only way these two characters could possibly enjoy happily-ever-aftering is to maintain interlocking lies – his self-delusion, her selfless deception – forever more? Would even Alfred Hitchcock have had the audacity to spring something so thoroughly unsettling, if not downright perverse, on us? Nice Post .thanks for posting. Relocation hacks help you to move quickly in your new house. will make proper preparation to make your move smooth.